Muskoka is now Ontario’s most sought after cottage country, recently dubbed “Malibu of the North,” as marvellous mansions play home to A-List celebrities such as Martin Short, Goldie Hawn, Steven Spielberg and Tom Hanks. When Hollywood’s elite and the who’s who of Toronto are looking to kick back and relax in Ontario cottage country they find happiness first at Taboo Resort Muskoka. 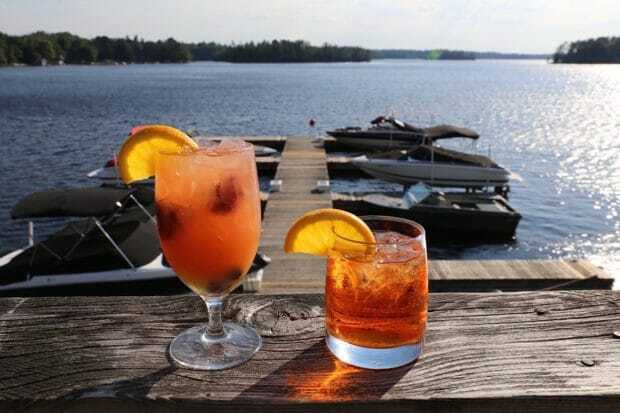 The property has been welcoming guests to the shores of Lake Muskoka since 1926, first as the Muskoka Beach Inn, when guests mainly arrived by horse and buggy from the Gravenhurst railway station, then from 1959, as the Muskoka Sands, and in 1985 as the Taboo we know today. The luxurious lakeside resort features 59 spacious suites and 93 condos designed in a modernist style by Anna Simone. 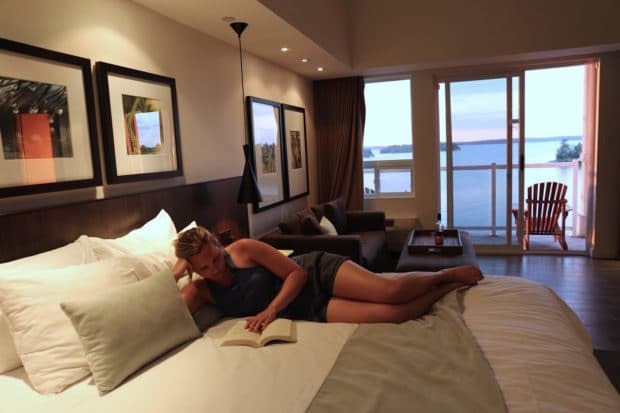 Our 440 sq ft suite featured a plush king bed, booming gas fireplace, elegant bathroom with amenities by Hydro Spa and a balcony where two adirondack chairs offered the perfect perch to sit back and relax as one of Muskoka’s legendary summer sunsets splashed across the sky. There’s nothing lovelier than waking up to watch the sunrise over Lake Muskoka. Light dances on the slick surface, twinkling across a string of petite islands. 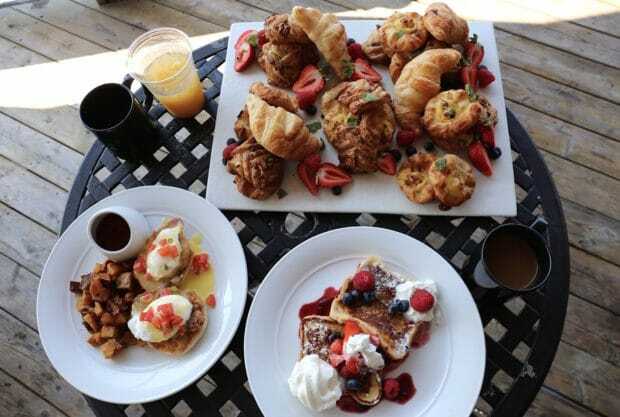 Wake up to the world while sipping a mug of freshly brewed coffee, nibble on an epic pastry platter and lovingly fork through steaming plates featuring classic Eggs Benedict and local berry topped French Toast. If you’re keen on a quenching after a long day spent sitting in the sun pop by the Boathouse Bar for freshly muddled libations. Grab a stool and sit perched over Taboo’s marina, gawking at beautiful boats which putter past as you clink glasses of white wine sangria and Aperol Spritz. After completing a successful stint as a professional football player in the CFL Chef Adedeji Oduwole pursued his passion for cooking. Upon completing his culinary diploma at the Pacific Institute of Culinary Arts in Vancouver he traveled to Caceres Spain to work at the 2 Michelin Starred Atrio Restaurant. After returning to Canada he worked in top notch kitchens at the Vancouver Club and Bymark before helping craft the food program at Taboo. Hungry guests gather at the resort’s lakeside Boathouse Restaurant each evening for a cottage country inspired feast. 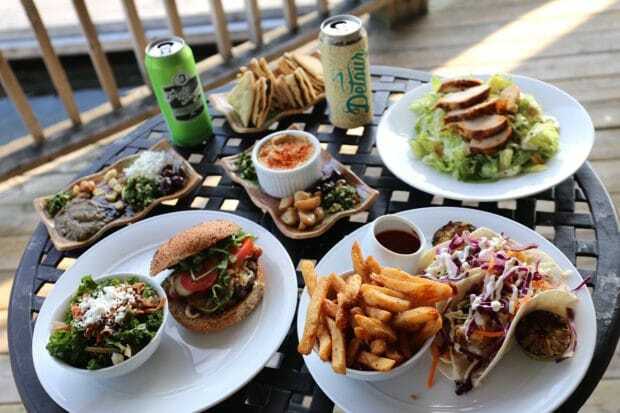 Highlights include a bacon and cheddar topped burger, crispy fried fish tacos and epic Mediterranean Platter featuring hummus, tabbouleh, pickled eggplant and baba ghanoush. Consistently voted among Canada’s Top 50 courses and renowned for its panoramic beauty and innovative use of the dramatic Canadian Shield landscape, the Taboo golf course is a captivating and challenging layout set at the gateway to Muskoka, one of Canada’s truly outstanding golf destinations. 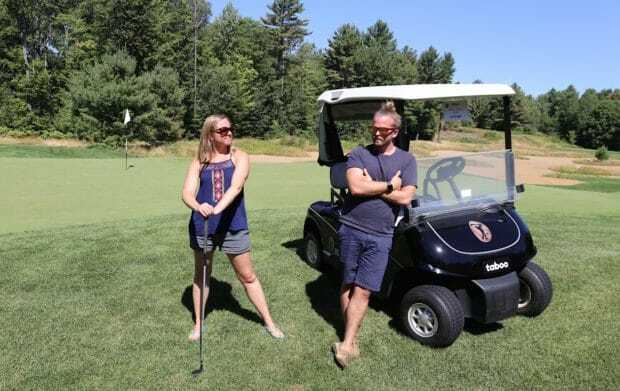 The landmark Ron Garl designed Taboo golf course opened in 2002, a major milestone in Muskoka’s emergence as a top North American golf destination. It is here in the heart of cottage country where 300 acres of memorable terrain are embraced by dense forests of tall white pines and mature red oaks. Taboo’s golf holes are shaped by distinctive pink granite outcroppings. Each hole sits in isolation from the rest, with 15-minute tee time intervals helping to preserve that feeling that you’re golfing a private course. If you’re a lake lover with a need for speed visit Muskoka Boat Rentals and enjoy an afternoon weaving through waves. 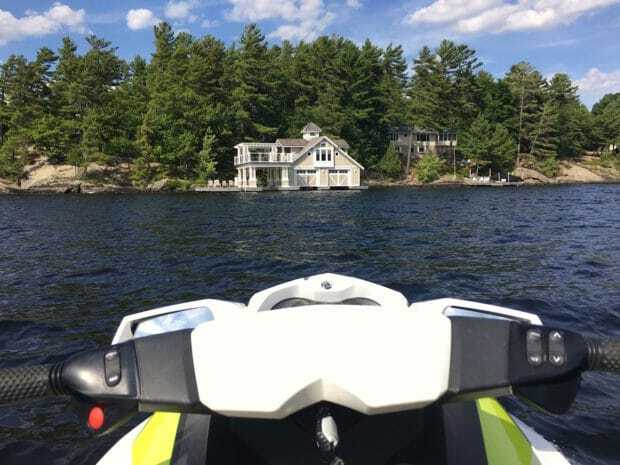 We spent an hour zipping along Lake Muskoka on a Sea Doo staying close to the shore so we could gawk at the jaw-dropping properties on Millionaire’s Row. 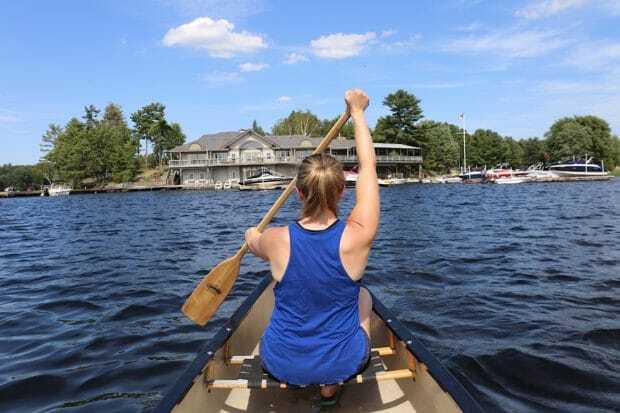 If you’re looking to enjoy a workout on the water hop in a canoe or kayak and paddle your way along the shoreline of Lake Muskoka or the nearby Hoc Roc River. Rentals are complimentary for all resort guests. Pay a visit to Taboo’s Recreation Centre and grab a two wheeler from the resort’s fine fleet of CCM mountain bikes. 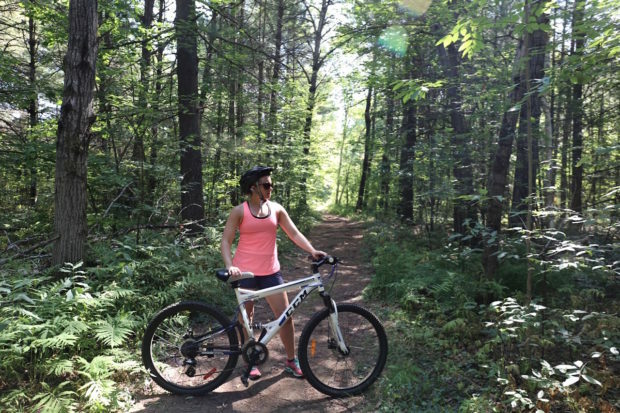 Peddle across the street and you’ll find an expansive network of nature trails perfect for hiking or biking. The woodlands of Taboo’s 1,000 acre resort are filled with forests of old pine and ancient oak, spectacular Canadian Shield rock ridges and beaver ponds, birds and wildlife. There’s always something cool to see on Taboo’s 5 km of winding mountain bike trails. Handy, pocket sized Taboo trail maps help guide the way! 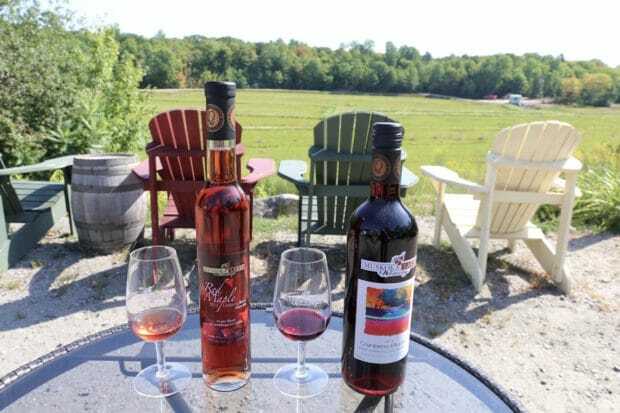 The wee town of Bala holds the proud title “Cranberry Capital of Ontario,” and there’s no better way to appreciate the locally grown fruit then on a tasting tour of Muskoka Lakes Winery. The winery’s Bog to Bottle Tour has Canadian Signature Experience status and allows curious guests to follow cranberry production from peat bog to delicious wine. Highlights include the top selling Cranberry Blueberry Wine and a sweet slosh of Red Maple Dessert Wine featuring the winery’s award winning Cranberry Wine muddled with maple syrup. Leave your calorie counter in the car! 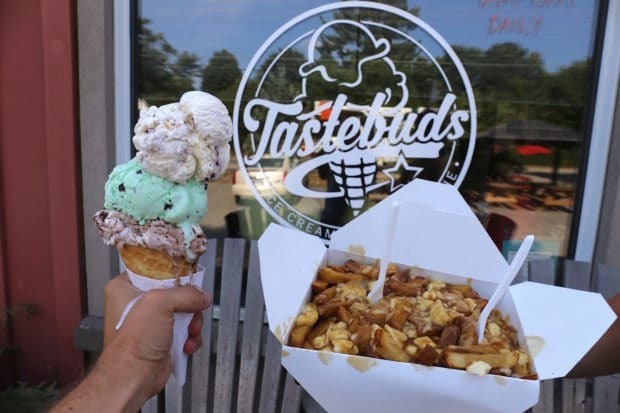 Tastebuds in Gravenhurst is a new addition to Muskoka’s munchie scene offering hungry visitors a selection of Kawartha Dairy Ice Cream flavours, perfectly cheesy poutine and freshly baked butter tarts and nanaimo bars. Sawdust City Brewing Company is dedicated to the art and science of creating exceptional craft beers. 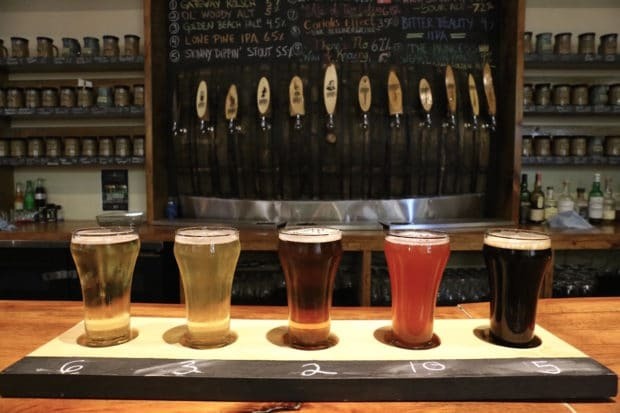 Brewmaster Sam Corbeil and his talented team create award-winning exciting beers that expand the borders of traditional flavour profiles from their 20,000 sq ft facility on the main street of Gravenhurst. The Canadian-made brewhouse includes a canning line, barrel-aging room, large retail store and Tap Room where live music entertains sud-sloshers every Friday and Saturday night. The Tap Room features a 24-foot live-edge bar milled from a 100-year-old naturally felled pine tree, honouring the long history of logging in Muskoka. Hop up on a bar stool here and you’ll find 12 draught lines and friendly bartender keen on walking you through a tutored tasting. Highlights include thirst quenching Little Norway Pale Lager, refreshing Golden Beach Pale Ale and one-off Kick Start My Heart Sour IPA featuring cherries, raspberries and strawberries plucked from local farms. 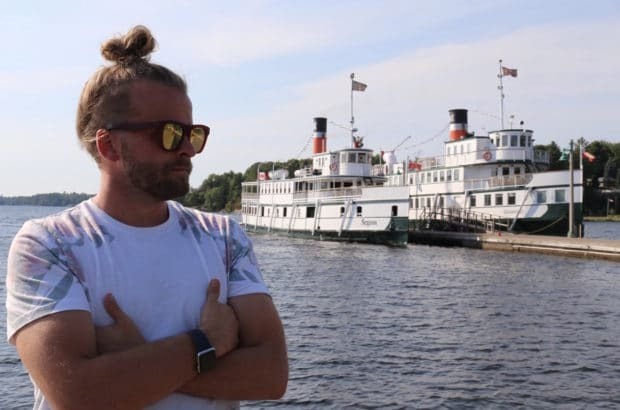 No trip to Muskoka is complete until you’ve strolled onto the iconic RMS Segwun, North America’s oldest operating steamship. Splurge on your sweetie by grabbing tickets for the sunset dinner cruise and you’ll romance the night away as you putter along Lake Muskoka in style. The leisurely 3.5 hour cruise features a three course dinner served in the ships vintage dining salon. Enjoy a swirl of wine as the sunset splashes across the horizon.